Home » Greenroom » Are You First Aid Compliant? Workplace safety cannot be overemphasized. The management and the employees need to work hand in hand in order to achieve it. But there are times, no matter how much care and preparation that goes into workplace safety, that accidents will happen. When those accidents happen, the personnel in the workplace should have the tools and knowledge to deal with it. Workplaces should be equipped with the proper knowledge and training of first aid. In States and Territories across Australia, the Work Health and Safety Act is mandatory. It is imperative that workplaces today are compliant with the various requirements of the Act. Being first aid compliant can mean the difference between life and death or an employee living with a disability or being able to fully recover. For those reasons alone, making sure that you are first aid compliant is a must. The First Aid in the Workplace Code of Practice was released in 2012. This aims to help in the adoption and compliance of the Work Health & Safety Act 2011 of the federal government. The revisions of the regulations have made it a lot harder for companies and businesses to become first aid compliant. The changes can be confusing for some. There are those who assume that since they were compliant with the old regulations that they do not have to worry. That is not usually the case. You can conduct a “health check” which is a kind of self-assessment to see if you are complying with the new regulations. The best way to know if your organization is following the new first regulations is to get an independent assessment from a credible third party such as Alsco. You can visit AlscoFirstAid.com.au to know more about how to get an independent and comprehensive assessment of your workplace and find out what it needs in order to become first aid compliant. They can support your first aid compliance status so you do not have to worry about it and you can focus on other aspects of your business. Overall, the figures are pretty dismal. In the state of Victoria, the state that has the highest percentage of first aid compliance, only one out of six organisations is able to meet the standards of the new regulations to be compliant. If that is how bad the situation is in the most compliant state, you can only imagine how dismal it is for the least compliant. The different states and territories were assessed using these three factors. Based on the report, the least first aid compliant state is Western Australia. It shows the state is only 8.8% compliant which is almost half as low as the most compliant state. This is a disappointing figure since it means that less than one out of ten workplaces in the state are actually meeting the new standards. If you are located in western Australia, you need to act right away to check if your workplace is included in the 8.8% that complies with the new regulations. Contact your local Alsco branch manager and he would be happy to help achieve compliance. Becoming first aid ready goes beyond buying a first aid kit and keeping it in the office. Being first aid compliant and ready means that personnel in your workplace can deal with accidents and all kinds of medical emergencies that might result. Dealing here does not mean final treatment. It is just enough to provide the right response until the arrival of EMS or until an injured person can be taken to a hospital. An adequate amount of personnel trained to deal with emergencies based on the size of your workplace. Enough supplies, facilities and equipment. A procedure that can be followed in case of an emergency. All three aspects are very crucial to being compliant. Without one, the others would be useless. Without a procedure that your personnel can follow can follow during an emergency or in case of an accident, your equipment would be next to useless. 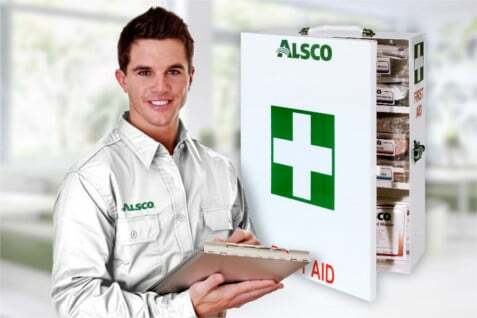 If you are still unsure if your workplace is meeting the standards in order for it to become compliant, it is time to get in touch with Alsco so you can be provided with honest and independent assessment of the first aid status of your workplace. They can also ensure that you will stay WH&S compliant to ease your burden.